As we celebrate a new year, spare a thought for Empress Elizabeth of Russia, who did not have much to celebrate as January dawned in 1762. 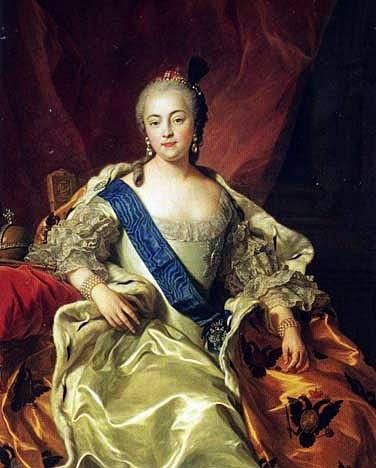 After two decades on the Russian throne she enjoyed the love of her people, respected for her refusal to capitulate to the policies of Prussia as she stamped her mark on her own country. Elizabeth seized the crown after orchestrating a bloodless coup in 1741 and promised at the time that she would sanction no death sentences during her reign. It was a promise that she kept and one that only added to her popularity amongst her people, as did the certainty with which she steered the country through the Seven Years' War. However, as we have seen so many times, all the grandeur and political success in the world were of little import when the time came to depart this mortal coil, and things were no different for Elizabeth. As she entered her fiftieth year, the Empress became aware that her health was beginning to fail and as her dizzy spells became more frequent and debilitating, the court physicians were summoned to tend to their monarch. Elizabeth, however, was not willing to submit to their treatments and instead she decided to soldier on, coping as well as she could with her ailments even as she became increasingly paranoid about the fate that awaited her, even going so far as to forbid her courtiers to use the word death. Of course, forbidding discussion of death and avoiding medical treatment are not appropriate remedies for illness and the Empress declined further as the winter of 1761 deepened. Years of high living caught up with Empress and though she finally agreed to take her medicine, it had to be dipped in marmalade or otherwise sweetened; when bleeding or other interventions were discussed, she recoiled in horror at the very thought of it. Confined to her bed, she gathered her most trusted friends to her and said her final prayers, finally passing away on 5th January 1762. After more than a month of lying in state Empress Elizabeth of Russia was laid to rest, her popular reign at an end. Undetermined, though many years of somewhat drink-fuelled living probably didn't help!